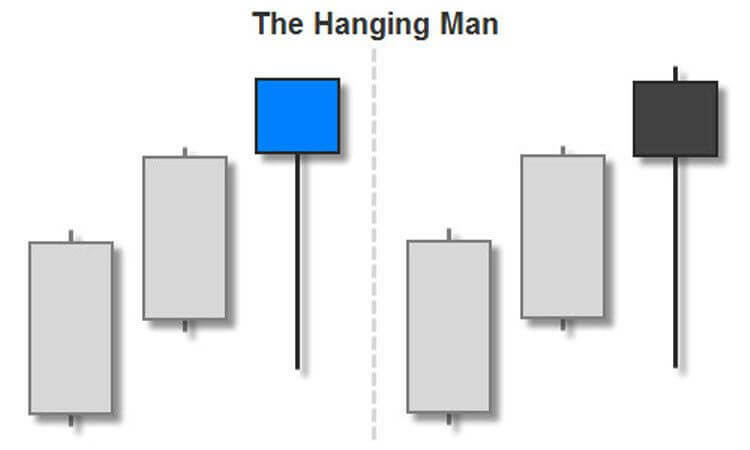 The hanging man is a very popular, but often misused, candlestick trading signal. In this addition to my price action course, my goal is to show you how to correctly identify and start trading the hanging man candlestick pattern (in the right situations). This popular candlestick formation is a weak reversal signal, and as a result, most experienced candlestick traders do not use the hanging man alone as an entry signal. Although the hanging man candle, when properly traded, is not typically used as an entry signal, it can be a great heads-up indicator. 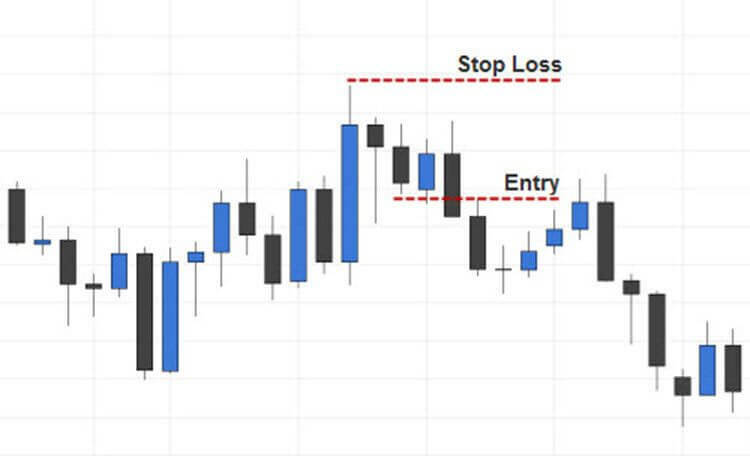 Especially when combined with a good system for entry triggers, this candlestick signal can be a powerful tool to have in your trading arsenal. Note: I do not recommend pure candlestick trading with the hanging man, at least not as an entry signal, unless it’s combined with a reliable trading system that has proven to be profitable on its own. What is a Hanging Man Candlestick Pattern? The hanging man is a weak bearish reversal signal. This candlestick looks like the hammer candlestick signal, only it appears at the top of a trend, or strong bullish price movement. Like the hammer candlestick, the hanging man should have a long lower wick/shadow (at least 2x the size of the real body), as well as little to no upper wick/shadow. The real body of the hanging man signal can be bullish or bearish (see the image above). For obvious reasons, this bearish reversal signal is considered to be slightly more bearish if the real body is also bearish. As I mentioned before, this candlestick formation is only considered to be a true hanging man candlestick signal when it appears after an uptrend. The context in which you take any candlestick signal is of utmost importance. Never trade candlestick signals from within price consolidation (flat or sideways markets). The psychology of this signal is that, even thought the bulls are still in control of the market, the market has shown an ability to move lower (long lower wick/shadow). This can make the bulls a little nervous, and some may start taking profits while they’re ahead. In the image below, you will see a series of hanging man candlestick patterns. In both cases, these formations happened during an uptrend, and in both cases they signaled an upcoming bearish price movement. As you can see, the second set of hanging man candlesticks signaled a full reversal in the trend. In either case, these candlestick signals would have been a great place to take profits on a bullish trade that you might have been in, which is how most successful candlestick traders use this particular price action signal. Example: You enter a bullish trade, riding the trend up as far as you can. When you see the first hanging man (in the example above), you close half of your position. Upon seeing the following bearish confirmation candle, you realize that you were right to be suspicious of the trend continuing. However, price doesn’t break the low of the confirmation candle, so you keep the other half of your position in play for now. Upon seeing the second set of hanging man signals, you close your remaining position. As demonstrated in the example above, you would have been wise to utilize this candlestick formation as an exit signal. Of course, if you had closed your entire position after the appearance of the first hanging man, your trade would have been almost as successful as the one described in the example, without the extra risk. 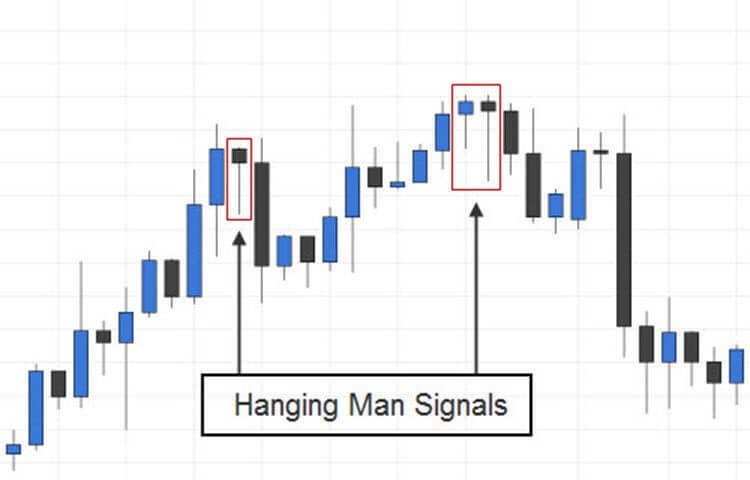 In the image above, you can see another hanging man candlestick signal, with dashed lines showing the proper entry and stop loss placement. Notice that the entry trigger is (1 pip) below the bearish confirmation candle – not the hanging man itself. The stop loss is placed (1 pip) above the highest high in the bullish cycle (current uptrend swing). As I mentioned earlier, I do not recommend pure price action trading with the hanging man as an entry signal. That being said, the technique above is the correct way to trade this signal as a entry trigger if you choose to. Also keep in mind that the hanging man can be a very high probability entry trigger when combined with a good trading system. The Top Dog Trading system, for instance, teaches ways to measure other energies in the market (cycle, momentum, support/resistance, etc.). When you know what the other energies in the market are doing, it’s much easier to qualify high probability candlestick signals. 1. The second large candlestick in the strong bullish move that preceded our hanging man candlestick pattern made a huge move upward, but the market rejected price at those levels (see the image above). This candlestick occurred to early in the trend to be considered a shooting star, but the long upper wick/shadow is still relevant. 2. Price retested those levels that the market had previously rejected (as it often does), and made some headway. However, while retesting those price levels, a hanging man candlestick signal appeared. This is considered to be a bearish signal, especially considering that it appeared within an area of such obvious rejection of price by the market. 3. The following candlestick is bearish, which is (depending on its relative size) a confirmation of the bearish sentiment of the market at the time. This means that the bulls are probably getting nervous, and taking profits on their open positions. This causes supply to go up, and price to go down. If you would have taken this particular hanging man candlestick pattern as an entry signal, placing your stop loss above the hanging man itself, you would have gotten a nice risk to reward trade. However, the correct place to put your stop loss, in this scenario, would have been above the large upper wick/shadow that preceded the hanging man signal, because that is the highest high in that particular bullish movement. Note: Putting your stop loss in the correct place on this particular trade would have yielded an unfavorable risk to reward scenario. So what do you do? You would simply stay out of the market. Successful trading means staying out of the market until conditions are perfect. Even then you will lose trades, so don’t just trade for the sake of trading. Keep in mind that candlestick trading is great for predicting short term market direction changes, but there is never a guarantee on how long any particular market direction will last. This is especially true with the hanging man, or any of the weak candlestick reversal signals. The context in which any candlestick signal is traded is very important. A true hanging man candlestick pattern can only appear after an uptrend in price. Never trade the hanging man, or any other candlestick signal, during periods of price consolidation (flat or sideways markets). As with any trading technique that you choose to try, wise money management skills will go a long way toward ensuring your continued success. Take only the best trade setups, use your stop losses, and make sure you are never overleveraged! Steve Nison recommends combining Japanese candlestick trading with western technical indicators to qualify the best trades. I personally use Nison’s candlestick techniques in combination with the Top Dog Trading and Infinite Prosperity systems. This is a great combination that has worked very well for me, but any reliable trading system could be combined to help qualify these candlestick trades. 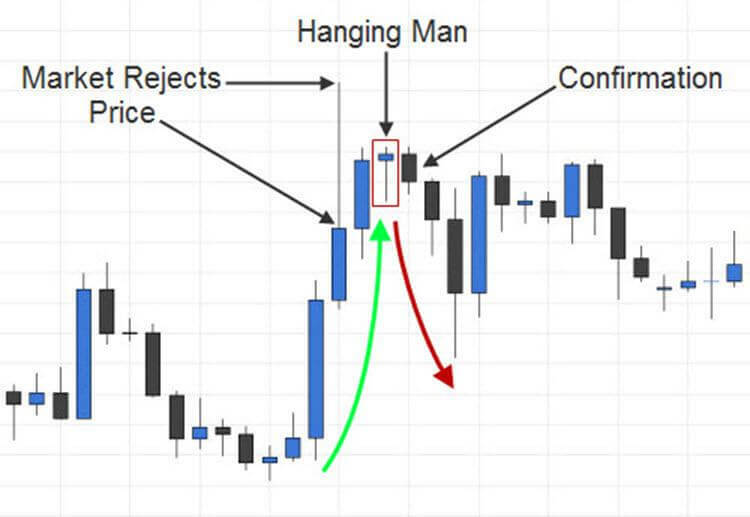 The hanging man is a very popular, but often misused, price action signal. Trading the hanging man candlestick pattern can be very fun and rewarding, if you know how to trade it correctly. As always, be sure to and demo trade this technique, until you have a firm grasp on it, before risking any of your hard earned money. What’s the difference between Hanging Man & Hammer, both look same. How much accurate is Price Action ? can we take Price Action only & trade ? Price Action change after few minutes(uptrend & downtrend) which happens in few minutes or maximum one hour so is Price Action only for intraday & not for short term because some people don’t have time than they carry trade next day so will Price Action work continously from previous day setup to next day or its only intraday ? Hello, Paresh! You’re right. The hanging man and hammer formation are essentially the same formation, but they occur in different places and signify different market psychology. The hanging man is a weak, bearish signal that happens only after an uptrend. It signifies that the market may be heading back down soon. As a weak signal, it is not recommended that you trade it without a confirmation candle. I would also not recommending pure price action with this signal, because it just doesn’t work out often enough on its own. It can be a great leading indicator to make a case for a trade though (in conjunction with other market forces). The hammer is a strong bullish signal that only occurs after a downtrend. This one is much stronger, so it can be traded more successfully via pure naked price action trading, although I still recommend combining other indicators (even if you only use the RSI at extremes) to filter out bad trades. Intra-day trading IS short term trading. It means trading on any chart lower than the daily one. To answer your question, price action works on all timed charts, but any trading signal (price action or other) is going to be more meaningful as you move up to higher time frames. I do swing trading and intra-day trading, but I would not EVER recommend trading price action on less than a 15 minute chart. Having said that, I rarely trade price action on less than a 1 hour chart. It has to be a beautiful setup (with lots of other indicators in agreement) for me to even consider it. To answer your last question, price action will either work or not. Nothing works all the time. Many times, price action signals will not cause a full reversal in the trend – only a small retracement. You can still be profitable on some of these so called “failed” trades in price action if you focus on getting a great buy or sell point every time. As a friend of mine likes to say, “Getting a good buy point can make the difference between going broke and becoming a millionaire.” Hope that helps you. Good luck!